Just wanted to send a few pictures of our “Mischa” that we purchased a year ago. As you can see from the pictures below she is growing like a little weed. She is very intelligent and beautiful. 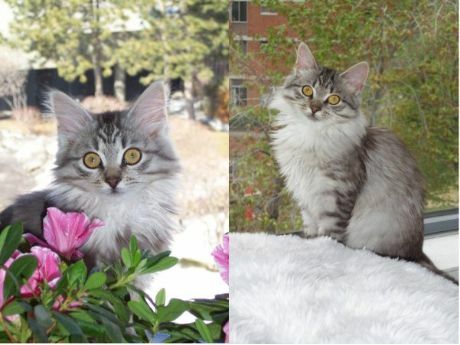 If we ever consider getting another cat is would definetly be a siberian! We are moving soon into a new house next month therefore she will be enjoying the country view and not to mention the birds! She’s definetly the baby of the family. Thank you for giving us the opportunity to have Mischa in our home.